Just Romantic Suspense: I wonder if every writer has a favorite hero? I wonder if every writer has a favorite hero? Congratulations to "Ann Q" and "Donna S", the winners of Mallory's giveaway. Thank you to everyone who participated. I wonder if every writer has a favorite hero? The one who lives inside her head and tends to pop up at really inconvenient times to make irritating and sometimes downright rude comments or critique what she's writing... or doing. I have to confess that I usually have a couple of these annoying yet magnificent men hanging around in my head. Most of the time I can exorcise them by writing their story. That's all most of them want is to have their own chance to be a hero and find their happily ever after. But occasionally, there's the hero who is so strong and so memorable that not even writing his story and giving him his very own HEA moves him to that virtual keeper shelf in my head where my written/resolved stories are stored. New Orleans Police Detective Devereux Gautier is one of those heroes whose presence is so charismatic, whose story is so memorable, that he remains in my subconscious mind, ready to pop up and offer his opinion when he thinks it's warranted. I can hear him now. "Nope. I don't watch TV. I'm a detective. I have people who watch for me and report back." Dev may be my favorite hero ever--hands down. He is Cody Maxwell's partner from my first Harlequin Intrigue, The Lawman Who Loved Her. He's been a perennial fan favorite and has, according to fan mail, fueled the dreams of a bunch of my readers, as well as my own. The title for his book, No Hero, is the perfect title, because that's exactly how Dev views himself. His childhood was a living nightmare that only got worse when he bashed his stepfather's head in, too late to stop him from killing Dev's sister. At age twelve, Dev was a fugitive. He ran and didn't stop until a beat cop named Thibaud Johnson caught him stealing whiskey. Thibaud chose to rescue Dev instead of sending him to prison, thereby saving his life and changing his destiny. Still, even with Thibaud's belief in him, Dev feels he has seen too much bad, too much ugly, to ever be able to give or accept love. Journalist Reghan Connor is on a mission to prove that there are no heroes. But as she learns more about Dev Gautier, she begins to see him through the eyes of the people who love and depend on him. The homeless teens he takes in idolize him, his fellow police officers respect and revere him, and his friends love him unconditionally. It isn't long before Reghan finds herself falling for the man whose honor and integrity shine from his hooded black eyes. But there is another player in this game of life and love and death--a malicious and deranged killer, bent on destroying everyone Dev loves, including the woman who started out as a thorn in his side and now is proving herself to be his match and his partner in all things. It wasn't easy to create a heroine who was a match for Dev. Reghan's stubbornness, her tenacity, her habit of knowing she's always right, clash with Dev's single-mindedness and his belief that he is the only person in the world capable of protecting the people he loves. I think Reghan is Dev's equal, especially towards the end of the book, as the danger intensifies and he needs someone to stand with him against the ultimate, terrifying danger. Dev and Reghan's story moves me each time I read it or think about it. I hope that NO HERO gives you as much suspense, intrigue, heartache and joy as it has given me. In the number one position of Mallory Kane's list of favorite things, which includes paper dolls, chocolate, kittens and snuggling, are books and stories. Once she convinced her mother to teach her to read--at age three, that was that. Her mother was a librarian and her dad came from a long line of southern storytellers. Mallory aspires to be as good a storyteller as her father. 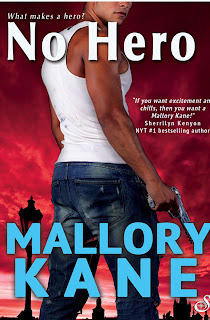 Entangled Publishing will be giving away a digital copy of NO HERO to one lucky commentor. An additional winner will receive Mallory's own Cajun/New Orleans treat. 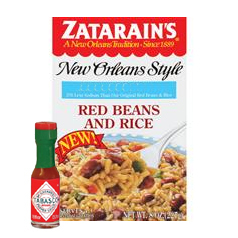 A package of authentic red beans and rice, which includes a collectible miniature bottle of Tabasco sauce labeled with "Mallory Kane, Real Heroes, Spicy Stories." Woo hoo!! Hot Stuff!! Giveaway ends 11:59pm EST Jan. 18th. Please supply your email in the post. You may use spaces or full text for security. (ex. jsmith at gmail dot com) If you do not wish to supply your email, or have trouble posting, please email maureen@justromanticsuspense.com with a subject title of JRS GIVEAWAY to be entered in the current giveaway. US and CANADA mailing addresses only for the Tabasco sauce winner! This sounds like a great story...I love heroes that overcome a broken past and the heroines who are strong enought to be their match! Thanks for sharing and the chance to win a copy I'd love to read! Love the cover and the book sounds like a must read also! Suspense, intrigue, and romance...makes for a great read. Would love to read this. Love the title ... you know the guy that claims he is not a hero is going to be one in every way. Thank you for stopping in and the giveaway. Just the kind of story I love, romantic suspense. Oh I enjoy reading about heroes that do not see themselves that way... it is great to see them get a HEA... thanks for sharing a little bit about Dev and Reghan! Interesting question. Thanks for sharing. Dev sounds like an amazing hero. Great interview and a great prize. I have never had New Orleans food before. This would be my first. Loved the book - love the new cover for No Hero! Sounds fantastic! Congrats to Mallory on the new release! Thanks for sharing! I am so looking forward to reading No Hero - it just sounds like a great read. Thanks for the chance. It sounds like I've just found a new favorite. Dev sounds like a keeper.